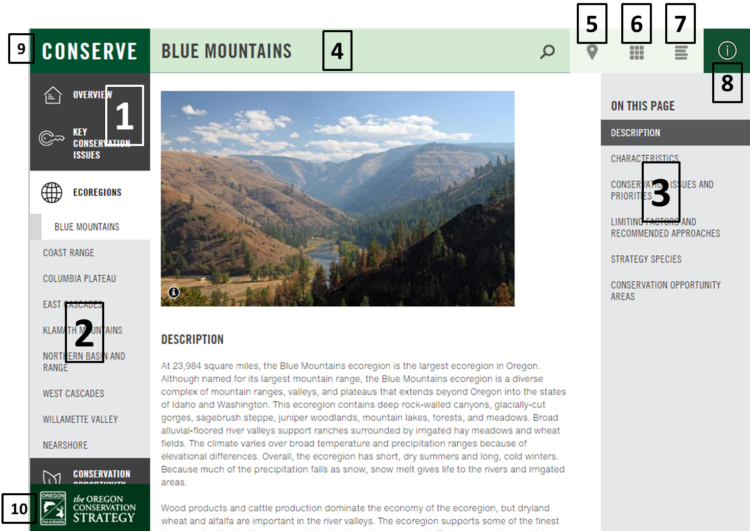 The primary Oregon Conservation Strategy (Strategy) sections are listed in the left hand menu, available from every page within the OregonConservationStrategy.org website. Selecting a Strategy section opens the associated content, and opens up a menu of available sub-sections beneath the selected section. Many pages offer an additional menu on the right-hand side of the page, providing the ability to jump to specific content within a page. On all pages, the title of the page also serves as the site’s search tool. Click anywhere within the title/search-bar, type in your subject of interest, and select the magnifying glass to search for specific content throughout OregonConservationStrategy.org. When specific pages contain associated mapping layers, the “map pin” tool is made available. Selecting the map pin provides an interactive map preview of the associated mapping layers. Within the preview, you can use an additional button to view the layer(s) within ODFW’s Compass mapping application. Selecting this button allows you to access additional layers and options, search for a specific map location, generate reports, and many other features. When available, this opens a “grid view” format for the page being viewed. For example, Strategy Species and Conservation Opportunity Areas listed within ecoregions will now be shown in a grid image format. On the Conservation Opportunity Areas (COAs) page, this orders COAs in alphabetical order. When available, this opens a “list view” format for the page being viewed. For example, Strategy Species and Conservation Opportunity Areas listed within ecoregions will now be shown in a listed text format. On the Conservation Opportunity Areas (COAs) page, this orders COAs by COA ID number. Access help content for OregonConservationStrategy.org, including Site Navigation, FAQ’s, how to connect with ODFW, and ways you can help the Oregon Conservation Strategy. Brings you back to the OregonConservationStrategy.org home page. Opens the ODFW conservation page, within the ODFW website. What is the Oregon Conservation Strategy and how is it used? The Oregon Conservation Strategy is an overarching state strategy for conserving fish and wildlife. It provides a shared set of priorities for addressing Oregon’s conservation needs. The Conservation Strategy brings together the best available scientific information, and presents a menu of recommended voluntary actions and tools for all Oregonians to define their own conservation role. See the Strategy Overview section for more information on Strategy components, Strategy background, how the Strategy is used, and much more. How do I search the Oregon Conservation Strategy? The top bar of all Strategy web pages doubles as both the title of the page, and a search bar. Entering species, habitats, conservation concepts, or any other term into this search bar will provide all Strategy pages that contain content relevant to your search. Many webpages within the Oregon Conservation Strategy have associated maps, or spatial data layers. These pages are indicated by a “map pin” button (see Site Navigation section) in the top right corner of the associated pages. Clicking on a map pin opens a map preview of the associated data layer within the Strategy web page. An option then also exists to open the layer within Compass, ODFW’s mapping application for fish and wildlife species and habitat resources. Compass provides all available ODFW data layers within an easy to use mapping platform. You can also download ODFW GIS data using the ODFW Data Clearinghouse. How do I print the Oregon Conservation Strategy? You can print individual pages of the Oregon Conservation Strategy using your web browser. Many browsers will convert hyperlinks to hard copy links in your print-out, preserving links. ODFW has also developed PDF-formatted documents of all Strategy sections, which can also be downloaded, printed, and saved within your own system. However, some Strategy content is intended to be updated, such as maintaining links to partners and projects, and incorporating new projects and information as it becomes available. Users are encouraged to check OregonConservationStrategy.org for updated information. How do I access Conservation Opportunity Area profiles? All Conservation Opportunity Areas (COAs) have an associated COA profilfe, containing detailed information on recommended conservation actions, local conservation actions and plans, listed Strategy Species and Habitats within the COA, and other special features about the area. COA profiles are available by selecting the COA through the Conservation Opportunity Areas section of OregonConservationStrategy.org. COAs can be selected using the interactive COA map presented by default (select the COA, and then open the drop-down menu to see the profile link), or through either the grid view (where COAs are presented in alphabetical order) or the list view (where COAs are presented by order of COA ID). These views are available through buttons presented in the top right corner of the Conservation Opportunity Area page (see Site Navigation, above, for more details). You can also download COA Profiles in a tabular format. How can I get more information and stay connected to ODFW conservation efforts? Great question! Please stay up to date on events and relevant information using our Twitter and Facebook accounts, as well as other ODFW social media. You can also sign up below to receive the ODFW Conservation Newsletter, which is produced quarterly and includes information on ongoing conservation efforts throughout Oregon. Visit the ODFW website for more information on the ODFW Conservation Program. Please contact ODFW with more questions, comments, or suggestions: Conservation.Strategy@state.or.us. How do I cite the Oregon Conservation Strategy? Oregon Conservation Strategy. 2016. Oregon Department of Fish and Wildlife, Salem, Oregon. Stay connected to the Oregon Conservation Strategy and ODFW Conservation efforts. Check out news, events, and links to additional information within the ODFW Conservation Program.